Twenty-five of Emil's first twenty-eight film acting jobs were at Columbia Pictures' short-subjects department. 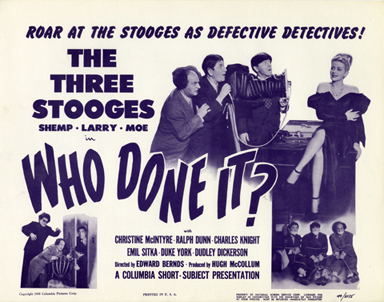 In WHO DONE IT?, his sixth appearance with the Three Stooges, Emil created another character that would earn him accolades for decades to come. Although it was a "rush call," as Emil explains in his diary entry below, he nevertheless enacted the role under Ed Bernds direction with finesse and skill, executing another memorable performance. This was a three-day job that couldn't have come at a better time. When one of Emil's sisters died several months earlier in Pennsylvania, he took time off to go back East for the funeral. Upon returning, he found he had lost his job. After months of unemployment and with a wife and four small children, Emil was nearly penniless as the holiday season rolled around. Between job-hunting, Emil had been rehearsing an act called "A Study In Surgery" with his friend Dom Di Orio, which they often performed at benefit and charity events. I got up late, and didn't go out in search of a job as I'd planned. And the hour to go to Sawtelle Soldeier's Home tonight with Dom Di Orio for a "benefit show" was drawing near. When Dom finally arrived and I resigned to go to do this "free show" even tho I was starving, a phone call suddenly electrified our household! It was from Columbia Studio! Yes - it was a "rush call" to come to work in the morning at Darmour Studio. A role with the Three Stooges! Our show at Sawtell was a huge laugh-success. We were last on the evening's program - and the funniest! My mind, of course, was still reeling with gladness over the life-saving call from Columbia and so tonight's performance just seemed to "roll off my back" with a "precise humor." I couldn't even care whether the flesh-peddler (agent) that Dom invited to watch us was interested or not! At Darmour Studio I was rushed into make-up, ward-robe - and ultimately into the very first scene of the movie. I was still trying to read the words from my script as the camera began rolling! Another day with the Stooges - at $75 per day - wow! What a God-sent relief! What a Xmas present! I rehearsed with Dom Di Orio, and this evening we went to a movie together, later to his home - where a note from Sunshine was awaiting me. She phoned to tell me that Hugh McCollum called for me to report to do "some retakes" tomorrow! I couldn't believe it! My wife assured me that was the case. All night I couldn't, and didn't sleep... My mind reeled. What went wrong! Why the retakes? Was it my performance? My characterization? My comedy? Or was it worn-through shoes, which I admit weren't correct for the millionaire I was portraying? I reported at Darmour Studio as per schedule. At 1 P. M. I was told to wait before putting on the make-up, maybe I wouldn't be used! This was good - and bad news, I thought. And so, the hole in the shoe became part of the released version of the movie. 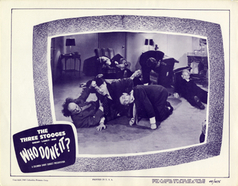 The photo showing the hole-in-the-sole was even used for one of the film's lobby cards. 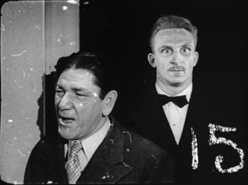 Emil wrote in his memoirs that this film was where he learned how to react to sound effects, or more precisely, the lack of sound effects. 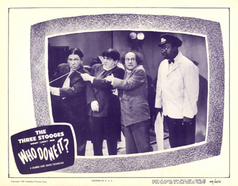 Many sounds in a Stooge movie were added later, but the characters had to react during filming as though they had actually heard the sounds. For instance, early in the story, Emil's butler drops a tray and some glasses. As props, these items actually produced very little sound when they hit the floor, but since exaggerated sound effects were going to be added, Emil had to bolt up in reaction as though they made a loud crash. Moments later, when a rock flies through a window, again the props made only muffled sounds, but Emil had to respond by leaping out of his chair. 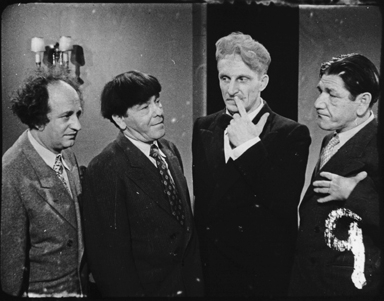 Emil came to believe that a large part of the comedy of the Stooge shorts comes from the effective use of humorous sound effects. Another thing Emil remembered about WHO DONE IT? was what he called a "big flub" that caused a ruckus on the set. In one scene, the Three Stooges crash through a closed door that gives way under their impact. The door didn't fall as expected, though, and the bottom edge of the door came up just as Moe was trying to step over it. Instead of going through the doorway over the door, Moe's toe caught the bottom edge of the door and hurt his foot. 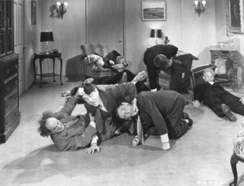 Then Larry and Shemp fell on top of him, further aggravating the injury. After a brief but intense flare of tempers and some exchange of "blue" language, filming resumed, but Moe exhibits a fairly severe limp throughout the remainder of the film. WHO DONE IT? 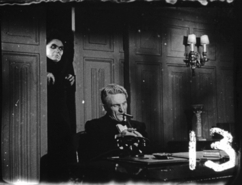 was a re-make of PARDON MY TERROR from 1946, starring Gus Schilling and Richard Lane. 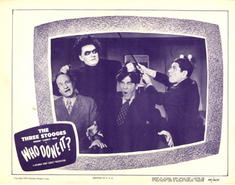 The Three Stooges were originally scheduled to star in PARDON MY TERROR, but they were replaced by Schilling and Lane after Curly suffered a stroke one week before filming began. 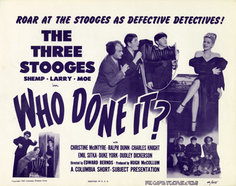 A year and a half later, the script was revamped with several alterations and produced once again, this time with the Stooges, including Shemp as Curly's replacement. 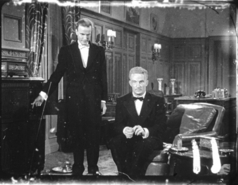 This is another example of two films in which Emil is featured in both the original as well as the re-make, where there were different stars in each version. Another example is HOT HEIR (1947) and GENTS IN A JAM (1952) in which Emil plays the same character in both. For PARDON MY TERROR and WHO DONE IT? however, Emil enacted two entirely different roles. 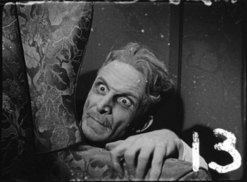 While he portrays the landlord in PARDON MY TERROR, he played the victimized gentleman in WHO DONE IT?, a role that was played by Vernon Dent in the original. In the controversial practice of repackaging older Stooge films for release as new movies, WHO DONE IT? was itself "re-made" nine years later as FOR CRIMIN' OUT LOUD (1956).